Popcorn is a very popular snack and whether you’re watching a movie or just want to indulge in a healthier snack before dinner, a bowl of fresh popcorn is always a good idea, which is why we found the best popcorn maker for you – Presto 0521 Orville Redenbacher’s Stirring Popper. Like most popcorn makers we tested, it prepares huge amounts of delicious popcorn but with no burnt or unpopped kernels. The impeccable performance of this popcorn maker is one of its unique features that accentuates the simplicity of the design. It has a built-in melter that distributes butter while the popcorn is busy popping, which is a part of this model’s few basic features that makes it a top pick for your popcorn moments at home. With only a 3/4th cup of kernels, you can get a generous amount, 20-24 cups, of fresh popcorn without any unpopped kernel remains. The Presto Stirring Popper is made of all metal and the coating of the interior pan is not at all prone to chipping and pealing, unlike many other popcorn makers that we tested. What’s more, the performance of the Presto Stirring Popper is a unique characteristic that is unmatched on the market so you will not have to worry about facing any performance-related issues with this unit. 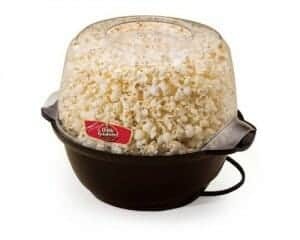 The top/lid of the popcorn maker can easily be used as a serving bowl and is built nice and thick so it doesn’t crack, even when subjected to regular use. The Presto Stirring Popper’s exceptional performance combined with its features make this unit a great small appliance product with a stirrer that works like clockwork. But if you are comfortable with shelling out a few extra bucks for a popcorn maker that costs more than the Presto Stirring Popper, then we would recommend the Cuisinart CPM-700 EasyPop Popcorn Maker. What makes this popcorn unit a close runner-up is the fact that it gets the popcorn ready in less than six minutes only and it also comes with many useful safety features that are not found in any other popcorn makers on the market. Since it is a step up pick, the Cuisinart CPM-700 Easy Pop costs slightly more than the Presto version, which means you get special additional features like an extremely short electrical cord and an on-and-off switch which are essential features built to make sure that your kitchen counter looks clean and organized, and also to add convenience while preparing the most popular snack in your home or office. While the Presto Stirring Popper and Cuisinart CPM-700 EasyPop are amongst the best popcorn makers, nothing beats this West Bend 82505 Stir Crazy Popcorn Maker when it comes to purchasing a unit that is pocket-friendly as well as excellent in performance and design. The West Bend Stir Crazy 82505 can prepare up to 28 cups of popcorn in well under five minutes. Talk about a budget-friendly pick that doesn’t compromise on quality and quantity! We highly recommend the West Bend 82505 Stir Crazy Popcorn Maker for a budget pick as it comes with a large top/lid, an on-and-off switch and built-in cord storage. These are the qualities that one looks out for when buying the best popcorn maker on the market. The unit has a dishwasher-safe bowl and a cover with a sufficient number of vents in order to allow proper releasing of the moisture from the popping corn, so your popcorn comes out as a delightful and appetizing treat. What do we know about popcorn makers? Why should you buy a popcorn maker? Shopping for the best popcorn maker can be confusing and a tad overwhelming too if you’re unable to decide which one to pick and what kind of features to look out for when trying to narrow down or refine your search, so here are a few things to know before buying a popcorn maker that will help you in the purchase process and ensure that you buy the best popcorn maker on the market. We all know that a popcorn maker’s size is pretty standard but there are some that are able to prepare more than the normal 20-24 cups of popcorn in one go. So, first you need to decide on the size of the popcorn maker that you want to buy to enjoy your snack time at home or in the office. The larger the bowl of the best popcorn maker, the more corn kernels you can add in the unit, which means that you get quite a generous amount of popcorn just in one batch. If you don’t like spending too much time in preparing your light and frequent snacks of the day, then we recommend you to pick the best popcorn maker that has a comparatively high wattage than the rest on the market. The higher the wattage, the quicker the popping. This is best suitable when you’re frequently hosting parties or events at home, with adults or children, because who doesn’t like butter popcorn, seriously! One of the most important considerations to take into account in order to ensure that you’re buying the best popcorn maker is the material of the unit. Almost all the best popcorn makers are made of BPA-free plastic housing but make sure that this material is durable too because you would want your popcorn maker to last for a sufficient and satisfactory period of time before it starts to show signs of wear and tear. The best popcorn maker is one that is constructed with metal throughout and a non-stick heating surface with a triple-layered heating plate which increases performance and makes the cleaning process easier. Even though some consumers are okay with kitchen appliances that have basic and simple features, it is always a great idea to invest in a product with additional features that enhance usability and provide safety. Among the many additional features that the best popcorn maker offers, a useful on-and-off switch is one that provides convenience, which is rated as the number one factor when deciding to buy the best popcorn maker. Another helpful feature that is found in the best popcorn makers on the market is a short cord. This helps in avoiding the risk involved with long cords since they normally have a knack of hanging loosely from kitchen counters. Such a situation can prove to be quite a nuisance if you have children running around in your house. We know how much people love to eat popcorn as it can be a very light and healthy snack when it’s not prepared with excessive oil and unhealthy additives. Popcorn is one of the best options as far as salty and crunchy snacking is concerned. It’s not only fun to eat but also pretty easy to make. Thanks to popcorn makers! Popcorn makers have been a part of the kitchen appliance industry for more than 100 years now. Microwave popcorn was quite popular back in the days when the whole concept was discovered but now, with the invention of the best popcorn makers, popcorn cooks just as fast and smoothly as microwave popcorn. In fact, it is much healthier to prepare popcorn in a popcorn maker rather than consuming microwave popcorn. And, much like the 1970s, when healthy eating came into the picture, healthy snacking is also receiving encouragement with an increase in products like popcorn makers. The question should be “Why shouldn’t you buy a popcorn maker?” Making your own popcorn at home sounds like a fun idea, especially when you’re watching a great movie or just hanging out with friends and family. And even for parties and family get-togethers, chewing on a healthy and delicious snack like popcorn is never a bad idea. All you need is the best popcorn maker and you’re good to go, or in this case, good to eat! But that’s not the only reason why you should buy a popcorn maker. If you’re a foodie and love pampering yourself and your taste buds with delicious snacks in the day, then buying a popcorn maker for a quick and light bite is a genius idea. Unlike microwave popcorn, popcorn made from a popcorn maker has many benefits, both health and financial, that serve as unique factors and have widely contributed to the ever-growing popularity of the unit. We always associate unhealthy fats and high calories with snacks, but why to worry about such things when you can control the fats and oils found in those very snacks! With the best popcorn maker, you can prepare a light, healthy and fresh snack while, additionally, adding all kinds of flavors to the popcorn, which don’t interfere with the calorie count in any way. Popcorn is high in fiber, which is essential for a healthy body. The benefits of homemade popcorn are aplenty, so you have all the reasons to get yourself the best popcorn maker right away. Popcorn is a whole grain, which has the tendency to lower the risk of cancer, heart disease and diabetes. Eating popcorn helps to keep your stomach full for longer. This is a great way to keep your diet in check in order to maintain a healthy weight or help with weight loss. Popcorn is known to be a good source of antioxidants which help in maintaining good vision. Microwave popcorn can be quite an expensive snack to indulge in, along with being unhealthy too, of course. Popcorn kernels, on the other hand, are definitely an inexpensive way to enjoy eating popcorn at home. Just the initial cost to buy the best popcorn maker is something you will have to shell out. But once that purchase is made, you will not have to worry about any other expenses. A five-pound jug of popcorn kernels costs not much and one batch of popcorn is made from only one-fourth a cup of kernels. You don’t have to be just a movie buff to enjoy popcorn. Lots of people who love snacking while chilling at home with family and friends or while having a drink by the pool are as much interested in investing in the best popcorn maker as movie buffs who love the sight of popcorn while enjoying a movie on their comfy couch at home. There are also many people who are slowly switching to light snacking to keep their weight in check or to help them lose some weight. So instead of consuming unhealthy and high-calorie count microwave popcorn, many people are opting for popping the corn themselves and enjoying a delightful and customized popcorn snacking experience at home. There are many popcorn makers to choose from, ranging from the lowest price you can imagine to the highest. So purchasing a popcorn maker that suits your budget is not such a difficult task but choosing the best popcorn maker to suit your budget and requirements does need some research as well as time. So our ultimate goal is to narrow down some of the best popcorn makers that not only prepare popcorn but also provide additional features for convenience and safety in your home. Every customer wants his/her product to do best what it’s designed to carry out, but as consumers, we’re always looking for those additional features or even basic, simple ones that tend to enhance the whole usability experience. So below are the criteria that we set in order to ensure that our list includes the best popcorn makers. The less the unpopped kernels, the better the performance of the popcorn maker. So we carried out tests and selected those popcorn makers that resulted in virtually no unpopped or burnt kernels, which means no waste and more popcorn. Some of the best popcorn makers are designed with an on-and-off switch, which makes preparing popcorn much easier. And what kitchen appliance is not better with an on-and-off switch than one that doesn’t have those controls! Similarly, you will find that the best popcorn maker comes with a short electrical cord. Now this feature is very helpful for a house with children. It also reduces the chances of the popcorn maker falling off the kitchen counter, as longer cords tend to hang over the counter and are easily prone to get pulled by accident or by children running around the kitchen. Additional features such as warranty, dishwasher-safe, built-in cord storage, and heat-resistant handles, are some of the unique and highly beneficial factors that we have weighed our choices against in order to bring to you the best popcorn maker. The Presto Stirring Popper has been selected as our best popcorn maker as you can make a generous amount of popcorn in just one batch with no unpopped or burnt kernels. Even though it comes with comparatively less extra features, its performance is something that beats all the other popcorn makers on the market. You can prepare up to 20-24 cups of fresh popcorn, the maximum that one can get from a popcorn maker. The performance of the Presto Stirring Popper is what we found to be the unique selling point of this unit. When we carried out the testing, there were no unpopped or even burnt kernels in our fresh and delicious popcorn, which reiterates the fact that the performance is highly exceptional and you will enjoy a delightful treat with every batch of popcorn prepared with the best popcorn maker. The Presto Stirring Popper is designed with a slightly different heating plate, unlike other popcorn makers. The rotating stirring rod inside the bowl moves the kernels around the heating plate in an efficient manner. You can add butter to your popcorn by placing it on top of the heating vent area. The butter will melt as the unit heats up and drip onto the popcorn inside. Once the popcorn is prepared, with the help of the heat-resistant handles, you can flip over the cover and use it as a serving bowl. Additionally, the company, Presto, provides delicious popcorn recipes in the instructions catalog that is found on the company’s website. Recipes such as classic caramel popcorn, Italian popcorn, Sassy South of the Border popcorn, to name a few. One feature that we’re in a habit of checking is the warranty. And the Presto Stirring Popper comes with a one-year warranty, which is a very useful additional feature that every best popcorn maker should offer. As the best popcorn maker, Presto Stirring Popper is ranked high in performance but the material of the heating plate is not nonstick like the other popcorn makers. Many popcorn makers have a Teflon-like nonstick coating that is present on the metal surface inside but the Presto Stirring Popper is designed with a different texture to add the corn kernels and oil. But, nevertheless, when we tested this unit, it worked just fine and we didn’t face any issues of popcorn sticking to the metal surface at all. Another flaw found in the Presto Stirring Popper is that this best popcorn maker does not offer a lot of extra special features, like many others, but that doesn’t make much of a difference in this case. The reason being, when the performance is so exceptionally flawless and smooth, it tends to fill in the gaps leaving no opportunity to complain about anything. So even though this model doesn’t have an on-and-off switch, you won’t really know the difference once you’re buttery popcorn has popped and you’re sitting on your couch and enjoying your wonderful treat with no unpopped or burnt kernels to chew. Our second best pick for the best popcorn maker is this beautifully designed Great Northern Hot Air Popper. You should know that this popcorn maker prepares popcorn in less than three 3 minutes, something that no other popcorn makers, even the best of the best popcorn makers, are able to do. This unit can make up to 18 cups of delicious popcorn in just about two and a half minutes. Naturally, the popping of the corn kernels happens faster and you get a bowlful of tasty and fresh popcorn in no time. Testing this product was pretty fun and interesting too. Since the Great Northern Hot Air Popper uses no oil for popping, the calorie count is even lower, which means light snacking becomes even lighter with this unit. Although you can add butter to the measuring cup which melts as you turn on the popper. Despite the electrical cord being comparatively longer than any other best popcorn maker, we found, while testing the product, that you can use this particular flexibility to place the unit wherever you like on the kitchen counter. If you need a higher level of additional features along with performance, we would recommend this Cuisinart CPM-700 EasyPop Popcorn Maker. Priced slightly higher than our first and second best picks, this unit is the best popcorn maker if you wish to enjoy some extra features with your kitchen appliances. The Cuisinart CPM-700 EasyPop is by far the best popcorn maker that we’ve reviewed. It prepares tasty popcorn in less than six minutes. The unique features of this product are- an extremely short electrical cord and built-in cord storage space, unlike the ones mentioned above, and dishwasher-safe quality. The Cuisinart CPM-700 EasyPop has a heating plate equipped with a stirring rod that efficiently rotates the kernels until they pop. The clear plastic dome of the best popcorn maker contains holes on the top in order to smoothly let out any steam released during the popping process. While testing this product, we realized that one must follow the instructions strictly when preparing popcorn in this unit. Don’t let the popcorn and oil rest on the hot plate longer than recommended. Otherwise, you’ll be left with burnt corn kernels that will simply go to waste as opposed to unpopped kernels, which you can obviously use in the next batch. The exorbitant price that you’re willing to pay for the Cuisinart CPM-700 EasyPop is justified once you read about this model’s extra features. It comes with an on-and-off switch, which will put an end to the whole plugging and unplugging problem on your kitchen counter. This best popcorn maker has a short electrical cord, a feature that customers with children look out for so desperately. Plus the cord has a helpful built-in storage space so you can keep the unit out of reach and store it conveniently. You also get a plastic measuring cup to decide how much of corn kernels you want to put in the popcorn maker. This will help in reducing the amount of extra popcorn that you always end up cooking and eventually throwing away. The instruction manual and the manufacturer’s website have delicious popcorn recipes that you can prepare apart from the basic salt and butter popcorn options. Last but not in any way the least important and unique feature of this best popcorn maker is its three-year warranty. Nothing beat this, nothing at all! The West Bend Stir Crazy 82505 is a great buy in every possible way. Not only is this best popcorn maker easy on the wallet, it’s pretty easy, convenient and fun to use as it prepares 28 cups of popcorn in one go. That’s pretty appalling, isn’t it? A large quantity of popcorn that is unbeatable by any other best popcorn maker on the market, combined with additional features like a dishwasher-safe bowl and convenient built-in cord storage make this pick a super budget-friendly option along with the best popcorn maker as far as its overall design, quality and performance are concerned. When we tested this product, we were able to whip up 28 cups of popcorn in less than five minutes. The cover of this model is well-designed with multiple vents to release any moisture that might make the popcorn look less delicious and more soggy. Avoid adding butter to the West Bend Stir Crazy as it tends to burn the corn kernels, producing large amounts of smoke during the popping process. The stirring rod of this best popcorn maker automatically rotates in both the directions to ensure that no kernels get stuck inside the bowl. This particularly helpful feature is not found in other best popcorn makers. The unit is well-equipped with an on-and-off switch so you avoid the risk of your arms brushing against the hot machine when you’re trying to unplug the popcorn maker. The clear plastic cover of this best popcorn maker can be used as a serving bowl, just like the other best popcorn makers mentioned on our list. This means that even though you’re paying comparatively less for West Bend Stir Crazy, every criterion that makes a popcorn maker one of the best is met. This budget-friendly popcorn maker also comes with a one-year warranty so you can contact the manufacturer if and when you face any problem with the unit. It is extremely difficult and annoying to get microwave popcorn to prepare the right kind of popcorn that you want. And on top of that, the popcorn prepared is not even fresh and can be unhealthy in so many ways. Sometimes it comes out overcooked or burnt while sometimes it’s undercooked. So you end up spending more time than you care for in order to whip up a quick and delicious snack for yourself. But with a popcorn maker, especially with the best popcorn maker, you don’t have to worry about such issues at all. All corn kernels pop as they should in the best popcorn maker, which drastically reduces the amount of popcorn we put to waste. Popcorn makers are very easy to use and don’t take up much space on your kitchen counter. The best popcorn maker is small enough to fit on your counter and also small enough to be easily and quite conveniently stored in a cabinet. Plus, it prepares a healthy, light and extremely delicious snack well in under five to six minutes, so you can enjoy the movie on your comfy couch or simply just spend your time with family and friends in a delightful manner. Apart from the best popcorn makers listed in this helpful article, there are many others that can also be ranked among the best popcorn makers on the market. This 1950s-inspired design can prepare up to 10 cups of popcorn in less than two or three minutes. Marked as one of the best popcorn makers, the unit is ideal if you want to try something different and unique in design and performance. Even though the Waring WPM10 lacks some extra features, its excellent performance that prepares a generous supply of popcorn makes up for the drawback. The best feature that one can acquire with any best popcorn maker is a five-year warranty, which this unit offers unbeatably. The West Bend Stir Crazy 82306 has been quite a popular kitchen appliance in American households. And it’s because this best popcorn maker can produce slightly more than 24 cups of popcorn in less than five minutes with no burnt kernels or unpopped corns. Remember that you don’t necessarily need to be a movie buff to buy a popcorn maker for you home. You can just as easily invest in a product like the best popcorn maker for your office as much as for your home if you’re a healthy snacker or simply can’t get enough of deliciously fresh popcorn. Our picks should help you decide which popcorn maker is the best popcorn maker on the market so you can make a wise and well-informed decision before spending your precious money. Opt for the Presto 0521 Orville Redenbacher’s Stirring Popper if you want the best overall performance; otherwise, pick the Cuisinart CPM-700 EasyPop Popcorn Maker to enjoy some special additional features. And if you have serious budget concerns, then go for the best budget-friendly option, the West Bend Stir Crazy 82505. Finally, let’s decide over a bowlful of popcorn, shall we? thanks for your review.would you recommend to me which kind of oils are more healthy and give popcorn delicious taste?